Most people don’t have any idea who they are supporting when they make purchases. They think a brand is a brand. Most commercial brands have a parent company. But who exactly is that parent and what do they stand for? Who are you handing your hard earned cash to? In comes this new app, Buycott. When you scan a barcode with this app, it will show you the product’s corporate family tree. Talk about purchasing power. Now you can shop with certainty where your $ is going. Is it going to Koch Brothers (Dixie Cups) or Montsanto (General Mills cereals)? 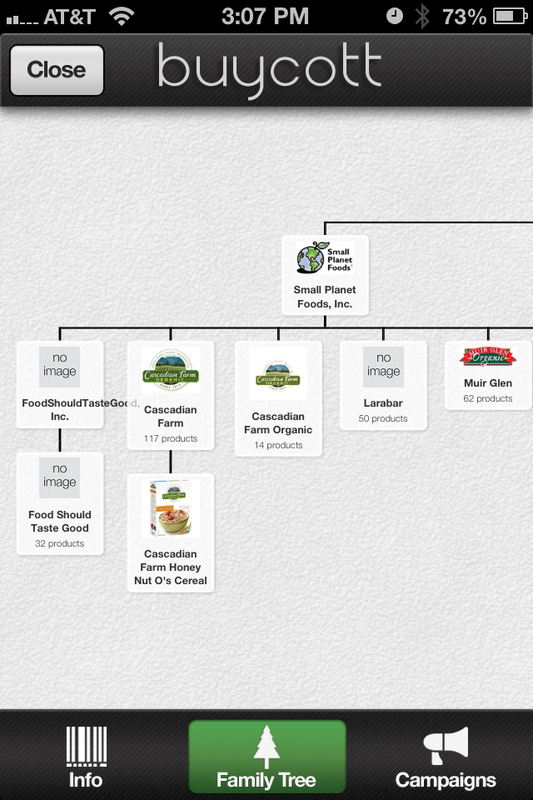 A random scan of Cascadian Farms cereal revealed a family tree that originates with General Mills. There are also user-created campaigns to boycott business practices that violate your principles vs. single companies, but also campaigns that encourage the support of other causes that you do believe in. Update: Android users aren’t able to us the app yet as the traffic surge caused problems. The bugs are being fixed. This entry was posted in DEPARTMENTS, Local Articles, Local Recipes, RECIPES and tagged GMO-free, great apps, healthy living, Montsanto, purchasing power, sustainability, useful apps by Healthy Living Bucks and Montgomery Counties. Bookmark the permalink. It’d be great if this app had more info about the higher-up companies, too – like, are they outsourcing jobs to other countries? Are the employees paid well – do they receive benefits? Hi Kate, that’s a great idea for them. I’m sure they’d appreciate the feedback. I know they are making improvements to the app right now, especially since it isn’t working on the Android platform yet. We have an iPhone and we’re having fun looking things up on it. It’s eye-opening to find out who the originating corporations are.